For transit-oriented development to work as planned its residents need be able to get to where they need to go without a car. That means having a safe and pleasant walking environment along with biking linkages between where they live, where they catch a train or bus, and where they shop and use other services. These are the results sought in “Complete Streets” policies, and local advocates can realistically seek their achievement. Complete Streets policies include a number of elements that together seek to safely and comfortably accommodate all users of roadways, including pedestrians, cyclists, and public transit riders. These elements include the goals of establishing a comprehensive, integrated, connected network for all modes of transportation, including encouraging street connectivity. Complete Street policies are also meant to include the latest and best street design criteria and guidelines while being context sensitive and flexible. Taken together, these elements direct transportation planners and engineers to design and operate the entire right of way to enable safe access for all users, regardless of age, ability, or mode of transportation. Achieving the vision of Complete Streets hasn’t been easy in many places on Long Island and in the Hudson Valley where 50 years of car-oriented development has radically changed the landscape. But it is precisely in these communities that leadership in Complete Streets has emerged. On Long Island the communities of Babylon (2010), Brookhaven (2010), Hempstead (2012), Islip (2010), North Hempstead (2011) and Southampton (2012) have passed local Complete Streets policies or resolutions, while in the Hudson Valley the municipalities of Dobbs Ferry (2012), Kingston (2010), Lewisboro (2011), and New Rochelle (2012) have implemented resolutions. In early December 2012, Suffolk County adopted the first county-wide Complete Streets policy for the downstate New York region. At the state level, the State Legislature followed the direction of local governments. 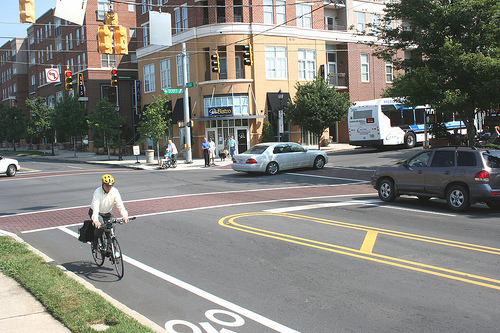 The initial effort to pass Complete Streets legislation failed in 2010 under the hue and cry—from legislators and highway officials alike—that Complete Streets was an unfunded mandate. However, when advocates came back to Albany the following year, they had the perfect foil to the arguments—Long Island communities were adopting local Complete Street policies with gusto. Recognizing the connection between walking, biking, smart growth and economic development, towns like Babylon helped demonstrate to Albany that safer streets are not an “amenity.” The statewide bill, passed in 2011 with unanimous votes in both houses, requires all county and local transportation projects undertaken by the State Department of Transportation or for projects that receive both federal and state funding and are subject to State DOT oversight, to consider “complete streets” designs. With 50 years of design philosophy to upend, there is still ample work to do. Since the New York State law doesn’t apply to all New York roads, advocates are at work again helping more communities pass policies. Recently, in conjunction with local partners, Tri-State Transportation Campaign released “Complete Streets in a Box” tool kits for Long Island, the Hudson Valley and Connecticut. The kits include a power point on Complete Streets, draft policies and resolutions, informational factsheets and videos, and a primer on liability issues (an oft-cited concern of local legislators)—tools that any advocate or legislator can use to help build momentum. Change does cost money, and unfortunately, both federal and state funds for pedestrian and bicycling infrastructure are shrinking. However, communities should remember that making streets safer can often happen with very small, inexpensive changes, especially compared to other transportation investments. Changing the timing of pedestrian count-down clocks can give seniors more time to cross the road. Narrowing car travel lanes from 12’ to 11’ or 10’ packs the double-punch of slowing cars down and providing extra space at the side of the road for bicyclists. Cross-walks that are painted with brighter paint can help both cars and pedestrians share the road. And putting brighter lights in dimly-lit areas helps everyone feel safer. If Long Island and the Hudson Valley are to achieve sustainable and equitable TOD, local leaders must recognize that one of the most important building blocks to doing so is the creation of bikeable and walkable streets.